Perú, land of new experiences. According to historical publications, the name of Perú comes after the Spaniards conquered the first settlement in the region: Santa María de la Antigua, on the shores of the Caribbean, on the border of Panama and Colombia. During his stay, the European invaders plundered all the riches of the native villages. It was in this bustle the conquistadors heard about a distant region (to the South) with so much gold that they would need several men to take it. The leader of the Spanish group was Vasco Núñez de Balboa who ignored the directions of natives and marched towards new lands that were lapped by the Pacific Ocean. Within that group was a veteran soldier named Francisco Pizarro. The tour was guided by the Tumaco chieftain who led the Spaniards to the coasts of South America, especially to the coast of Colombia. In these explorations, the conquerors would listen to a feared and powerful chieftain named Biru governing a province of the same name. Then, an idea in the Spaniards came. They should come against the indigenous leader to give death, but they never found him. 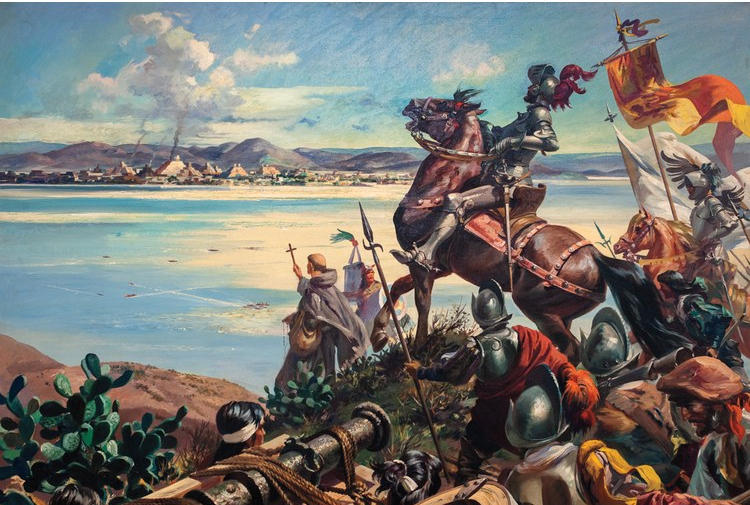 The swamps of the Amazon and mosquitoes discouraged the invaders who returned to Santa María de la Antigua. After these battles, the Spaniards decided not continue to seek the Chief. It was an unnecessary purpose. However, something happened in this Odyssey in search of the Kingdom of the Incas. In crossing the Spanish suffered an accident and was saved by the chieftain Biru. After this events. Andagoya fell ill and they returned to Panama. To the returned, much before he died, had already been the voice of the existence of a centuries-old culture full of gold and jewels. It is in this process that for the first time in history the word Peru is written. To be precise a 23 July 1523. The Spaniards named the promising land as the province of Perú instead of Biru. Actually, Perú has more richness than any can imagine. The truly gold is its landscape, historical places, and diversity of climates. You can live new experiences visiting Perú. Visit Perú and prove it new experience wait for you. 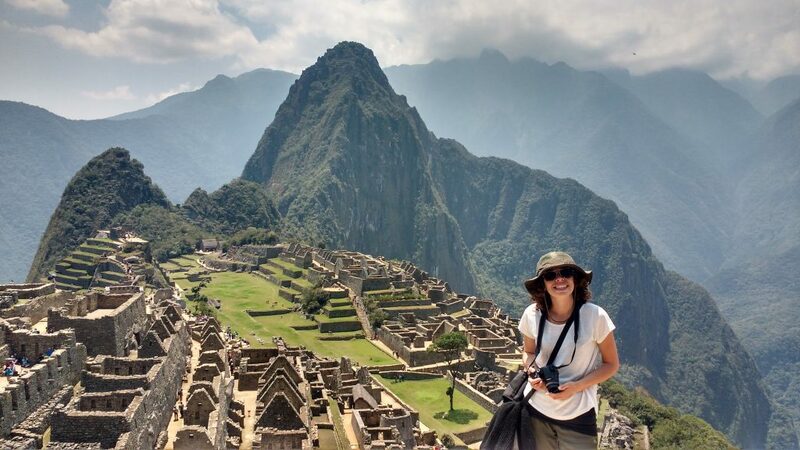 Author inkatrailPosted on July 17, 2018 Categories UncategorizedLeave a comment on Perú, land of new experiences. Visit different places around the World can be unforgettable and exciting experiences than anybody must live. 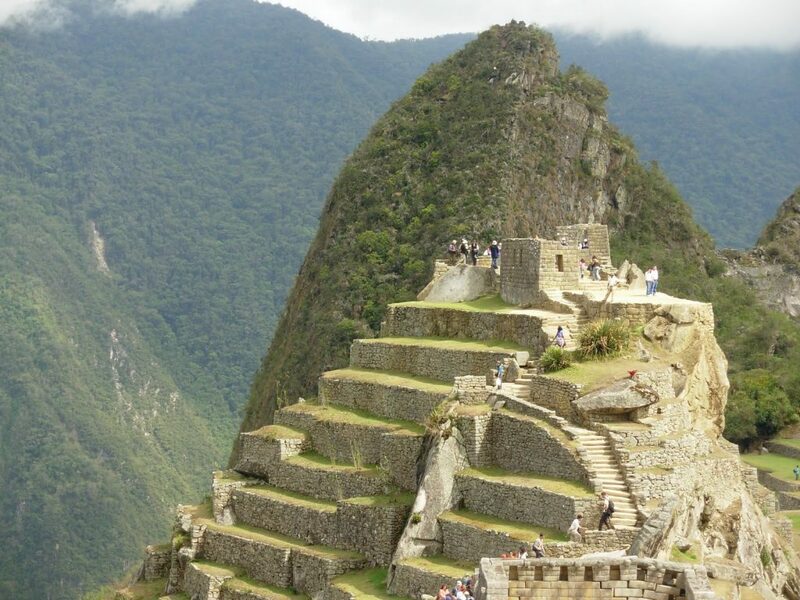 Enter the citadel of MachuPicchu is a new experience, new and magical experience. People who have ever visited this historic complex in the city of Cusco have returned to their countries satisfied to have lived an unforgettable experience. The Citadel of MachuPicchu is located in a sacred and mystical area, which harmonizes with the natural landscape, being a place of historical and cultural importance; And a demostration of the architectural elaboration of the Inca culture. It was built by Pachacutec (the patriarch of the Tawantinsuyu) and is a mysterious place, a monument to divinity, where people perceive that they are a creation of God. Located at 2,430 meters high in a place of great beauty, in the midst of a tropical mountain forest, the sanctuary of MachuPicchu was probably the most amazing architectural realization of the Inca Empire in its heyday. Its walls, terraces and gigantic ramps give the impression of having been carved in the cliffs of the rock, as if they were part of it. 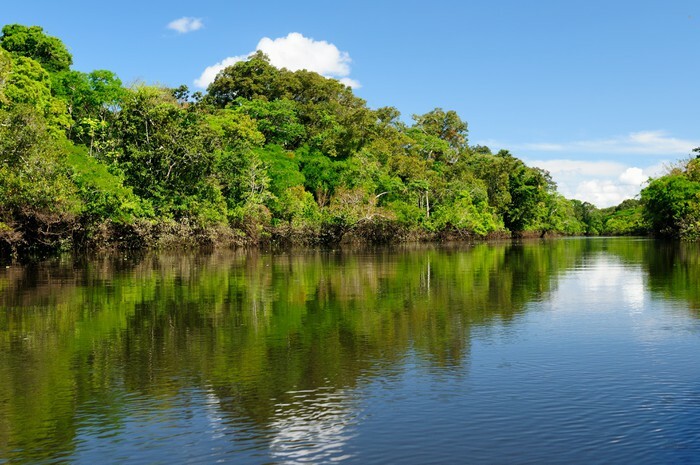 The natural setting, located on the eastern slope of the Andes, is part of the Upper Amazon basin, that has a variety of flora and fauna. Visit to citadel is a new experience. The experience of visit this Wonder World is anything nobody could tell with words, experience that you must to live. The visit of the place is done in one direction only. According to pre-established circuits previously agreed with the guide. The entry ticket is only valid only once; It is no longer possible to leave the place and re-enter later. The entrance and exit are located in 2 different places, so it is no longer possible to leave your things in the slogans at the entrance. Parasols, umbrellas and children’s cars are forbidden in the citadel. You can’t buy tickets directly on the spot. The only authorized baggage are the small backpacks or handbags. Please if you are going to visit our Wonder World take these advices and enjoy your visit waiting for back again. 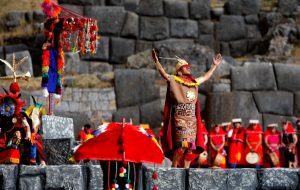 The Inti Raymi is a Cusco festivity celebrated from the time of the Incas during the winter solstice to worship the sun god, shades colorful costumes, banquets of luxury, festive music, and historical recreations. This festivity is in honor of the Sun god and performed in the presence of the Inca, the Willaq Uma or High Priest, Tarpuntay, Wirapirikuq and Kallparikuy, as well as the nobility and representatives of the Panacas, for which are used three impressive historical and natural scenes. The most important temple in Cusco some people said here exists a golden garden. Here develop a first part of festivity. In time of Inkas, was developed all of festiviy here. Now central part of this festivity is developed here. In 1572 the Inti Raymi was banned by Viceroy Francisco de Toledo for be considered a pagan ceremony and contrary to the Catholic faith. From that date it had to be held clandestinely. In 1944 Faustino Espinoza Navarro carried out a historical reconstruction of the Inti Raymi based on the chronicle of the Inca Garcilaso de la Vega. From that date the celebration was again a public event that until today is one of the main tourist attractions and Cusco festivity. Today the Inti Raymi is a theatrical representation, but also one of the most evocative traditional manifestations of our national identity because it symbolizes the values and memories of our past. 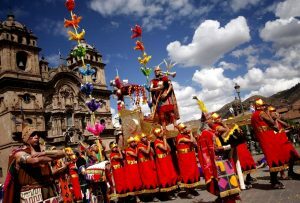 Is one of festivities more famous in Perú. Cusco has a lot of history alows us to connect with richness of its culture. All of city is bright and colorful environment. Cusco receives visitors anywhere of the world , brings together all of Latin America, being a display of culture, color and majesty. It is a incredible experience you can´t leave to live. Come and visit our World Wonder , Machupicchu. 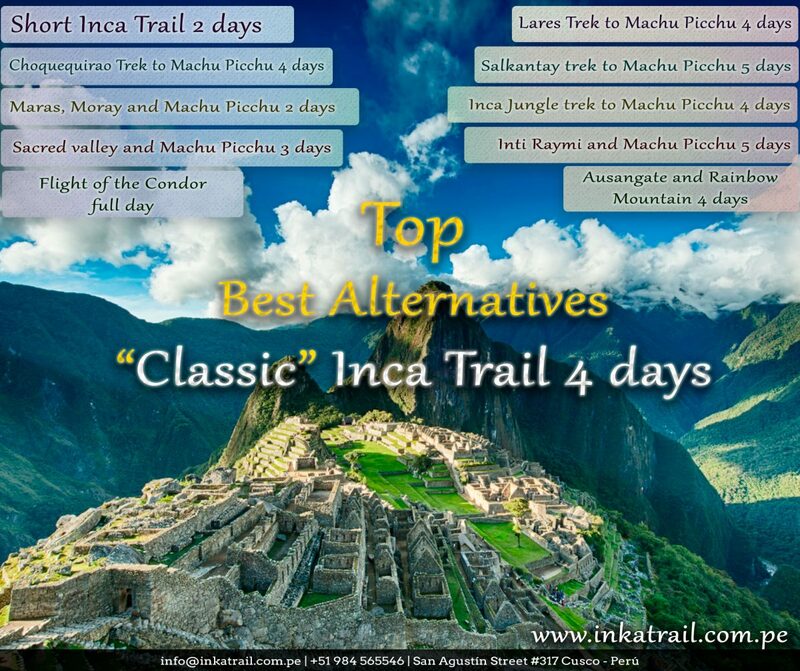 The four-day Inca Trail to Machu Picchu is already a classic of course (actually tickets are sold-out until August 30th, and half september too), but fortunately Cusco has other destinations with a common flavor to the Inca Trail, most of them are shorter in time. These are the best alternatives for this year 2018. 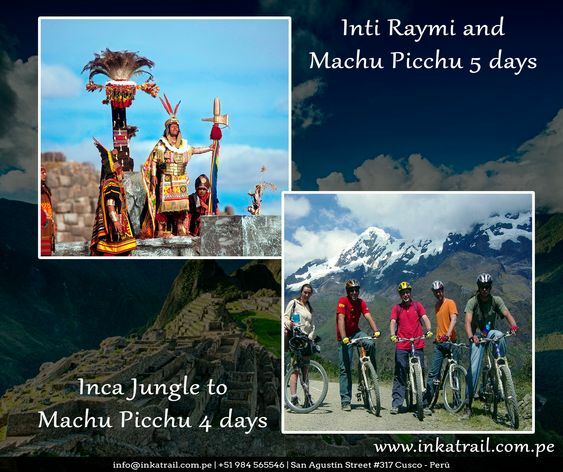 We will start with the Inca Trail “Short” of 2 days and 1 night, this tour begins at your hotel in Cusco, will be transferred to the train station and then travel to Km. 104. It will cover a walk that will take you to the highest point “Wiñayhuayna” at 8,700 feet which also has an impressive Inca architectural ensemble. 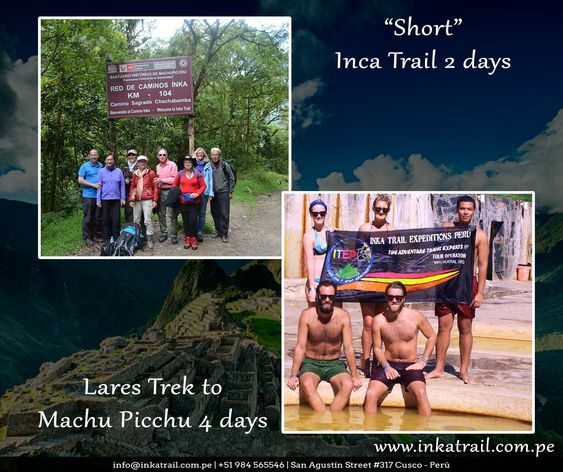 to finally reach the impressive Inca citadel “Machu Picchu”. which will enjoy the next day for a full day. A valuable option to consider, there is also limited availability, so you have to hurry to make reservations if you want to enjoy this tour. We will visit colorful Andean communities and meet their cordial and hospitable residents who live surrounded by impressive mountains. We will cross steps of more than 4000 meters. We will start with the visit of the relaxing thermo medicinal baths in Lares Trek and we will finish with the impressive visit of the Machu Picchu sanctuary. The recent discovery inca the last refuge of gold, the archaeological complex to Choquequirao is very interesting full of mystery and is one of the most popular hikes in the area of Cusco. 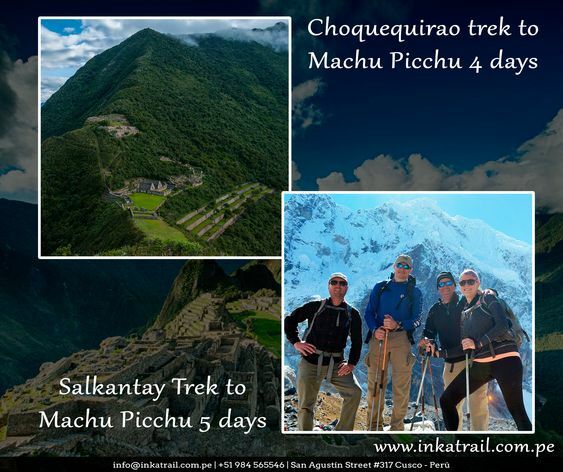 Salkantay trek to Machu Picchu is an avant-garde experience for adventure, for travelers looking for a little more privacy and authenticity. In addition to having more spectacular views such as snow, mountains, rivers, valleys, forests and wildlife throughout the tour to reach the historic sanctuary of Machu Picchu. With this program you will have the opportunity to discover the famous annual Festival of the Sun “Inti Raymi” held on June 24th. We also give you an overnight in Machu Picchu village to appreciate the sunrise over Machu Picchu Inca City. The Inca Jungle trail consists of riding a bicycle, and a trekking to the Inca City of Machu Picchu, which belongs to the Inca’s royal road to Machu Picchu, there are archaeological remains and beautiful landscapes on the route, we can even see the plantations of the Leaf Sacred of the Incas “the Coca Leaf” which are cultivated legally and with authorization from the Peruvian Government, this excursion is an unforgettable experience. Visit two of the most interesting and unique Inca archaeological sites in Peru, the “green houses” of the Incas in Moray with an impressive deep amphitheater like terrace swirling around in agriculture beauty; and the Salt Mine of Maras, watch the salt streams naturally evaporate as they bask in the sunshine to be harvested by the local farmers as they have done for centuries. The essence alive of the capital of the Incas. 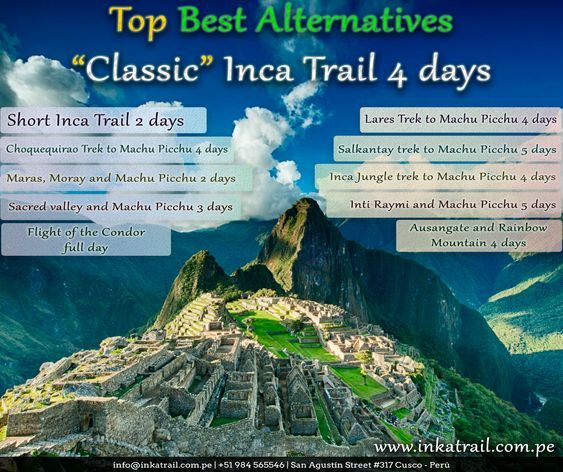 For those wishing to spend the night and wake up in the lost city of the Incas Machu Picchu. 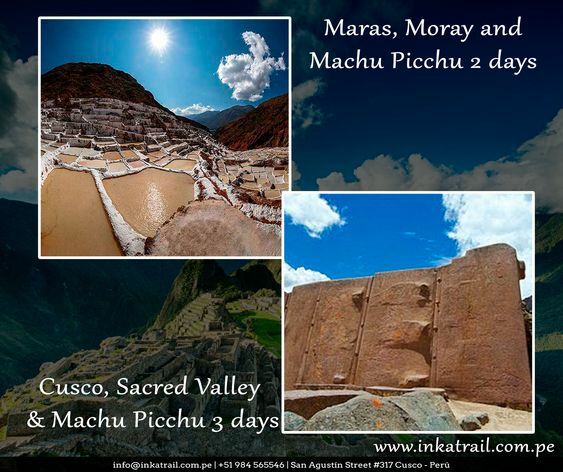 This program is made for visitors who want to experience the beauty and secrets of the Sacred Valley of the Incas and immediately connect with the village of Machu Picchu. 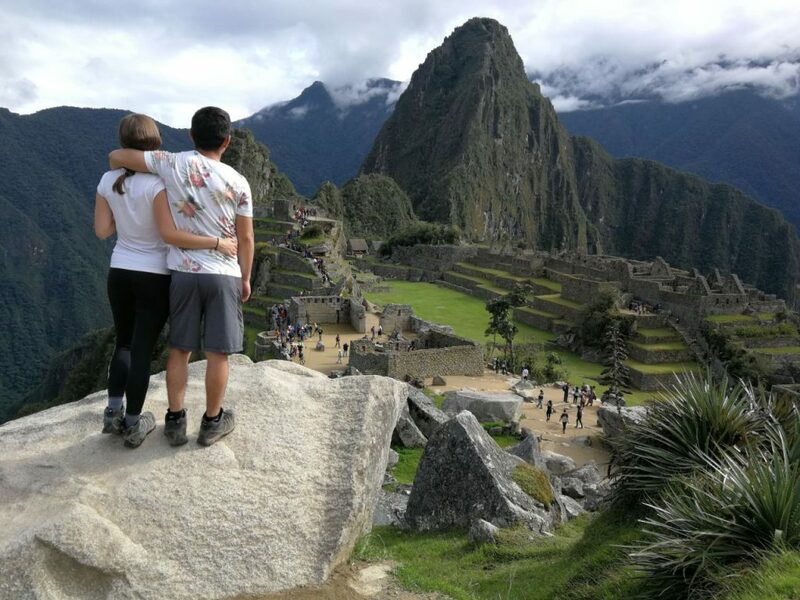 Village where anyone can relax in its hot springs, the main attraction of this package is receiving as a gift a beautiful sunrise in Machu Picchu. The flight of the Condor in Cusco is located in the rural community of Chonta within Limatambo district, nestled between the mountains that shape a canyon, found in the ecological floor Puna where you can see a wonderful panoramic landscape, forests, lakes, rivers and see the flight of the condor who daily make their trip of the area attracting tourists visit. Currently, this site features a habitat of 200 condors. You will explore the majesty of the Andes in Peru and learn about the traditions of the Andean people. The area is inhabited by traditional Inca animals, such as large herds of llamas and alpacas. In addition to seeing these impressive views of the peaks of the glaciers and the blue lakes. 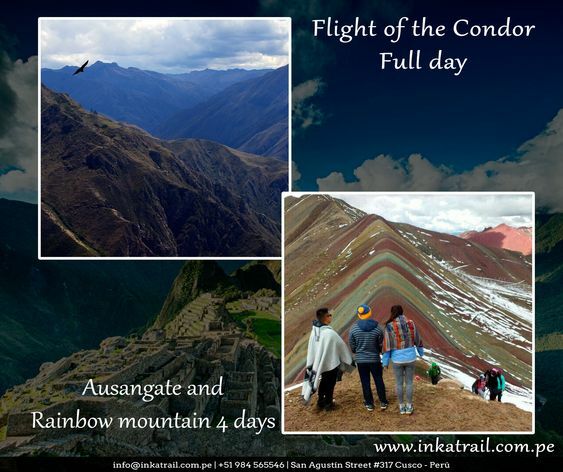 You will be among the first to enjoy the Rainbow Mountains (Vinicunca). Paucartambo is recognized as the folkloric capital of Cusco and Peru. Paucartambo dances are recognized. The gathering that starts this festival is done in the main square where bands of musicians play their instruments while richly dressed choirs sing in Quechua, kicking choreography witty passages depicting the history of Peru. During the day walking troupes dancing in the narrow cobbled streets of the town, preceded by bands and orchestras go down the streets. Everything is transformed into colorful costumes and musical chords. Pilgrims are interspersed with dancing crews, blending each other in a magical celebration. For five days, groups of dancers perform, the main day the Virgin is conducted in procession to bless those present in Paucartambo and scare off demons. The dancers’ Sajras perform gymnastic and risky tests on the roofs of houses, showing their outfits Inca and colonial styles. At the end of the procession there is a war against the demons, which the faithful emerge triumphant. Finally everything ends in “kacharpari” or farewell party. 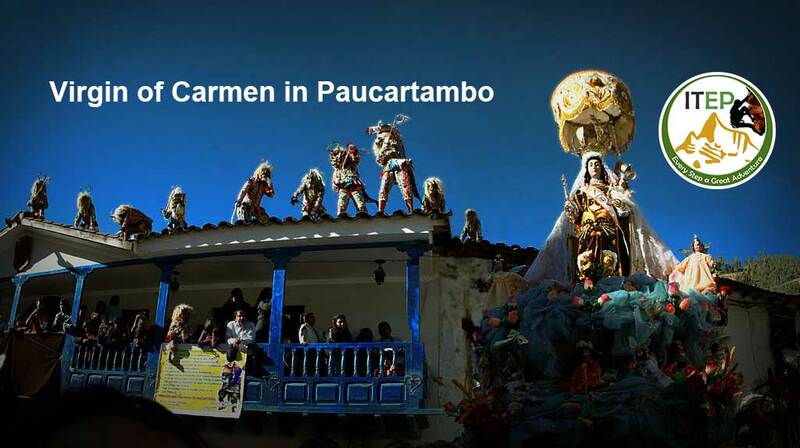 This festival is held every year in the colonial town of Paucartambo, at a height of 3,017 m.s.n.m. and 110 km. from Cusco approximately 4 hours from Cusco. The month Jubilee of Cusco and began, know when and where the main parades will be presented. 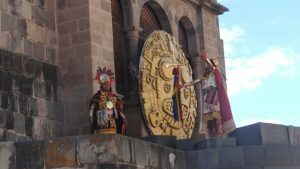 The Jubilee month of Cusco has arrived and thousands of cusquenian and even foreign are ready to participate in competitions and parades in various parts of the city. One of the most enthusiastic groups in Cusco always been made up of schoolchildren in different grades and schools, who year after year surprise with their allegories and well executed steps. Thus, in order to ensure the active participation of educational institutions in the three levels initial, primary and secondary, and no university in the area of the region of Cusco, the Regional Directorate of Education unveils the schedule of participation in the grand parade of dances that develop from June in the main square of Cusco city. 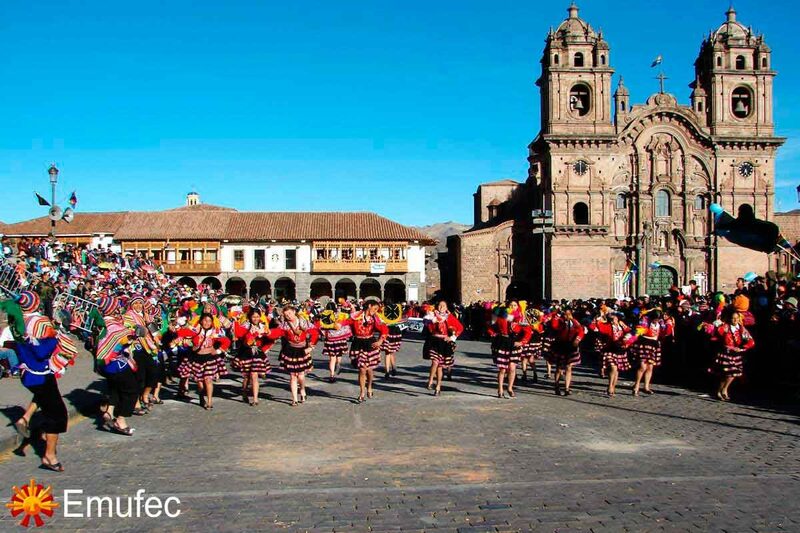 The parade of typical dances of Cusco of the educational institutions of the initial level is scheduled for Friday June 10 from 09:00 a.m; the participation at the primary level is scheduled for Monday June 13 from 09:00 a.m.